A must-see cloud formation that has gained high collecting points among cloud spotters is intortus clouds. How does it look like? What does it tell about the weather? Where and when can they be seen? All of these will be answered in the following paragraphs. Read further. Intortus clouds refer to cirrus clouds that have twisted or interlaced filaments or threads. This cloud variety only occurs in cirrus genus appearing in twisted strands with random pattern. The cloud got its name from the Latin word intortus which means twisted or wound. The Intortus cloud is visible at high elevations and is the most unique form of cirrus cloud. Its presence in the sky indicates that there is moisture at the high level atmosphere due to an approaching warm frontal system. At What is Height Intortus Clouds Found? Since intortus clouds only appear as high level cirrus clouds, they can be found at elevations above 16,500 feet from the Earth’s surface. Due to its huge distance from the ground, intortus clouds are primarily made up of small ice crystals. This is because temperatures at high atmospheric levels are below freezing point and when a mass of air is cooled, ice crystals are formed instead of water droplets. How does Intortus Cloud Form? Intortus cloud forms because of the condensation of moisture at high level atmosphere. It occurs as a result of warm air rising into the atmosphere due to an advancing warm frontal system. The rise of warm air causes the atmosphere to be unstable and with strong turbulence at high atmospheric level, ice crystals are blown out forming a twisted pattern. What do Intortus Clouds Look Like? 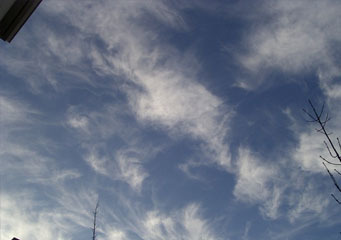 Intortus clouds take the form of cirrus clouds except that the cloud filaments are interlaced or tangled. In addition, the manner in which cloud filaments are organized can either be curved or irregularly arranged. Intortus clouds look like twisted fanciful mass of fibers presenting little overall arrangement. How common are Intortus Clouds? This type of cirrus cloud is common all over the world especially when a warm frontal system is coming. It usually appears during the winter and summer months, and when contrasting weather fronts collide like cool and dry air against warm and humid air. Along with other cirrus clouds, intortus clouds may be regarded as fair weather clouds too. But, weather observers and meteorologists view cirrus clouds as indicators of an advancing warm front. So if you see twisted or tangled cirrus clouds occupying the sky, you now know that they are intortus clouds. And just like other cirrus clouds, intortus clouds are generally indicative of friendly weather as they infrequently result to precipitation.